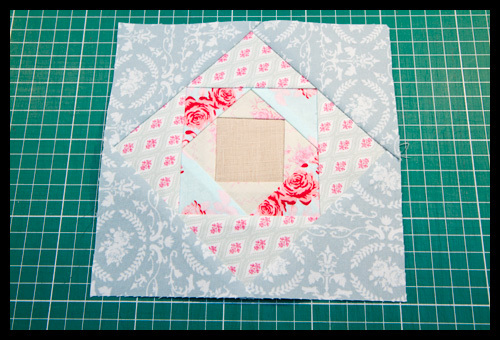 Tomorrow I’ll show you what I’ve been up to today in a variation on these first 2 weeks’ blocks for my FTLOS swap small items. I decided I could work with just 2 of the colours for my plan for these, so I cracked on with them. Fingers crossed I get the remaining colours for the big item soon! Yay! I can do triangles I think. 🙂 Your block is quite pretty with the pinks and greyish blues btw. I can't imagine not having all the supplies readily available. I am so spoiled. You make such wonderful things and this PP block is perfect. I am really going to have to give these blocks a go – I need to truly conquer my fears outside the blocks I have already done. oh i love that block katy! i can't wait to try it out! Really enjoyed the first block, fingers crossed this one goes well too! It looks lovely. Hope you are feeling a bit better now too. Great block! Must get started on these but it will be next week before I do! Ooh thats a pretty one. Also one I'd have to do foundation or it'd be all over the place! So nice to dip my toes in the process before trying the NYB…thanks so much for the tuts!